Although spring has officially sprung, don’t succumb to short sleeves at the first glimmer of sun. Spring’s temperamental weather is bad news for your internal thermostat, so you need to choose what goes on top carefully. Misjudged layering can quickly kill your look, be it a dodgy accessory or bulky silhouette. So, learn the less is more approach that keeps you cool and dry in style, as the skies oscillate between rain and sunrays. When chunky scarves go back in storage, a lightweight version offers more delicate adjustments to the temperature gauge. If you pick the right fabric, that is. Merino wool is extremely soft and traps heat without adding bulk, courtesy of air pockets that lock in warmth. Look for one with enough length to circle your neck twice – so you’re covered if the wind picks up – and in a neutral shade, so it works with everything in your wardrobe. A padded down coat offers two options: hot, or cold. 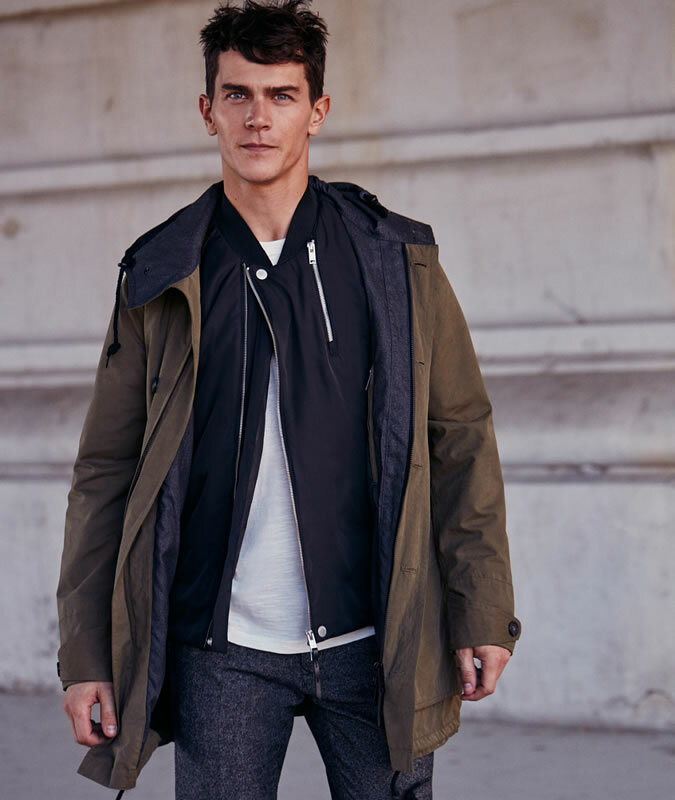 But swap it for a T-shirt, crew neck, bomber jacket and trench combo and you stay just as warm, courtesy of trapped air between each layer, but can peel off pieces as temperatures shift, so you neither swelter or shiver. Lightweight garments are also better news for your silhouette, which can veer top-heavy when the mercury’s low. To keep things streamlined, opt for finer materials close to your skin and step up in weight with each addition. As with weight, the same goes for length: shorter near your body, longer as you approach the elements. But over the last few seasons, reverse layering has offered a simple way to switch up your silhouette, with guys like A$AP Rocky and Kanye proving that a longline tee beneath a cropped bomber updates an otherwise basic look. There’s a common misconception that longline pieces are floaty and insubstantial, but designers and brands are now dropping hemlines on heavier garms. A longline jersey hoodie is a strong staple – worn over slim- or skinny-fit jeans it elongates your torso, plus it’s casual enough to wear as a standalone piece at the weekend or layer under traditional outerwear. Brands like Supra and Palace might be bringing back skate style in a big way, but there’s a limit to skate’s aesthetic appeal. Long-sleeved tops under short-sleeved T-shirts are a key culprit still popping up on runways years after their heyday. This is one trend that should be left back in the 1990s. Instead, try a cotton long-sleeved tee under a cashmere cardigan, to look casual and stay cool. Your suit game might be strong but bad outerwear can ruin your entire look. Spring rainwear needs to be waterproof but lightweight – ideally, slim enough to roll into your bag if you’re starting to sweat. Look for fabrics like gabardine, which keep the elements out but are breathable, so you don’t cook on your commute. This season, Aquascutum’s Voyager trench gave the pac-a-mac an on-point update; it’s completely waterproof, styled like the brand’s classic coats, but you can stow it in a pouch when the sun emerges. When Hedi Slimane made his debut at Saint Laurent, his first mission was to reinvent the checked shirt. Ignore those dodgy, stiff versions that used to be ubiquitous on the high street and instead invest in one crafted from flannel; the raised fabric traps heat without adding bulk. They’re seriously versatile – you can wear them open over anything from a tee if it’s balmy to a hoodie if it’s not, or even tie it round your waist in a nod to Kurt Cobain. Should we be blessed with an unexpected bout of barbecue weather.